Had there been no cross, Christ could not have been crucified. Had there been no cross, life itself could not have been nailed to the tree. And if life had not been nailed to it, there would be no streams of immortality pouring from Christ’s side, blood and water for the world’s cleansing. The cross is called Christ’s glory; it is saluted as his triumph. We recognise it as the cup he longed to drink and the climax of the sufferings he endured for our sake. As to the cross being Christ’s glory, listen to his words: Now is the Son of Man glorified, and in him God is glorified, and God will glorify him at once. And again: Father, glorify me with the glory I had with you before the world came to be. And once more: “Father, glorify your name.” Then a voice came from heaven: “I have glorified it and will glorify it again.” Here he speaks of the glory that would accrue to him through the cross. And if you would understand that the cross is Christ’s triumph, hear what he himself also said: When I am lifted up, then I will draw all men to myself. Now you can see that the cross is Christ’s glory and triumph. It should also be our glory & triumph, but only if united with Jesus. Where does the Cross fit in your life? Literally &/or Figuratively? 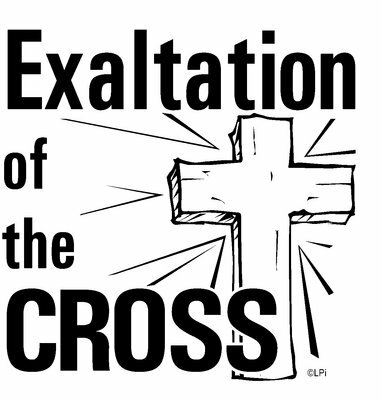 Lift high the Cross … Exalt the Cross of Christ! This entry was posted in Catechesis and tagged christ, Crisis, Cross, Dr. Margie Crooks, Faith, Jesus, salvation. Bookmark the permalink.